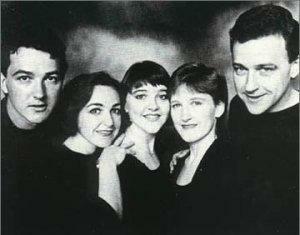 Desert Island Discs: “Souvenir (1989-1998)” by The Rankins (2003) | Name-Brand Ketchup. ← Don’t stay where you’re not wanted. I spent most of September 2010 traveling around Nova Scotia, particularly Cape Breton. Discussed it here and here. This two-CD set was my constant traveling companion, the soundtrack of my journey. I still play it at home and on the radio, as a reminder of one of the best times of my life. Hence a Desert Island Disc. And yes, it’s another greatest-hits compilation. The Rankin clan hails from Mabou, a town of 1,300 on the western coast of Cape Breton. A family of 12, they all performed in various groupings, at ceilighs and fairs, across the island for years and years. The youngest five got national attention (in Canada) and signed with EMI in 1989. So they became another incredibly talented band that was huge in Canada, but barely known in the US. See also: Great Big Sea, Blue Rodeo, Sloan, et al. The band went on hiatus in 1998, took on side projects, and raised their families. As homercat mentioned above: in 2000 John Morris Rankin, the older brother and virtuosic instrumentalist, was killed in a roadside accident not far from his home in Mabou. The remaining members were in shock to say the least. Since then Jimmy, Cookie, Raylene, and Heather have reunited as a foursome and in smaller groups, and continue to take on solo and other side projects. “Souvenir” chronicles the music made by all five of them together. The Maritime Provinces are best known for the strong influence of Scottish and Irish settlers on the sound of the region’s traditional music. This Celtic-derived music is most strongly expressed on Cape Breton Island, which is especially well known for the Scottish influx in the late 18th century and early 19th century. Scottish-style fiddle music, sometimes accompanied by the piano, was popular at the time, and these traditions survive today. In some cases, like Cape Breton Island, Scottish folk traditions are better-maintained than in Scotland itself…New Brunswick has seen a roots revival of their own Acadian traditions, dating back to before the French settlers of the area were expelled to Louisiana and became the Cajuns…While closely related to the three Maritime provinces, Newfoundland and Labrador is culturally and politically separate. However, the two areas share a regional awards show, the East Coast Music Awards, and a common musical heritage. As I say, this CD set was my traveling buddy throughout Nova Scotia. With a backdrop like that it’s obvious why it has a special place in my collection, but I’m not fickle; I continue to listen now that I’m back home. *Big smile* I hope your journeys take you back to the places you love and show you even more.